PRICE REDUCED! Convenient Location! 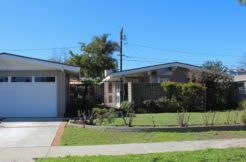 This LA home has three bedrooms, two bathrooms, and an open floor plan with living room, dining room, and kitchen. Upgraded kitchen and bathrooms with granite counter-tops and hardwood floors throughout! Hidden laundry area. Nice sized balcony for barbecuing or enjoying the view of the lush landscaping. Private, secure parking. Community gym and gathering room. Call to see it today!